In high school, in the mornings, on the way to my locker, while everyone else was hanging out talking to each other, I noticed this girl, always sitting alone in her homeroom classroom..every morning, just sitting by herself. I had no idea who she was; I had been at the same high school and with these same kids since middle school. I pretty much knew who everyone was but I didn’t know this girl. Well, after a few weeks of seeing her just sitting there, not talking to anyone I decided to just say hi, it couldn’t hurt, right. I knew what it was like to be at a new school, where everyone knew each other and no one knew who-in-the-heck you were. I had to change schools last year for just half the year while my step-dad was in the hospital and now I was back at my old school but for those 6 monthsto say the least, it was challenging. So, I knew what it was like to feel completely alone in a new school. So, I went for it and just said hi. I learned she was an exchange student from Poland. She spoke good English but with a heavy accent. After introducing her to some of my closest friends and all of us hanging out before class for a few weeks, we became friends. She told me she was living with a family that didn’t treat her or their own daughter very well. She wasn’t allowed to do after school activities or the group exchange student activities. She had a list of chores to do after school and then just had to hang out in her room. The exchange parents were also very verbally abusive to their own daughter and she had to witness it every day. I decided this was no way for an exchange student to be living and I had to do something about it. I went directly home and asked my parents if she could move in with us. This might not be such a big deal except that we were already maxed out at my house. We lived in a pretty small three bedroom house. I shared a room with my sister, and my three brothers shared a room, my step-dad was disabled so we were very short on money so how was it all going to work.but my parents agreed. For the next 8 months, my Polish friend slept on an air mattress on the floor between me and my sister’s bed. I tried to alternate letting her have the bed but she would not have it. She was very happy to be away from that other family. And even though my family was in no way an ideal family, she had to see us 24/7, at our best and our worst; she became one of my closest friends and part of our family for those 8 months. She went back to Poland after her year as an exchange student ended and we stayed in touch. Years later, she even wrote me a letter telling me how thankful she was for our friendship, for my family taking her in, and for that day that I decided to say hi. You can make someone’s day by telling them come sit with us #comesitwithus or by just saying hi #JustSayHi #JustSayHello. So, the person might not be an exchange student living with an abusive family but they might just be in need of a friend. 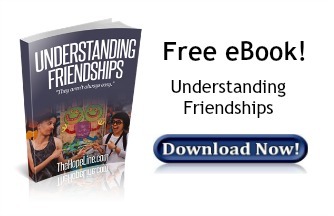 Friendships can be really hard, read more about how to make and keep friends, what to do if a friend is mad at you, and how to give good advice to a friend.